Ugh, I hate grading papers. Mrs. Rogers, do we really have to do this worksheet? Sometimes our complaints as teachers and our students’ complaints aren’t really all that different, are they? It’s easy for both of us to get frustrated when a task just seems mundane, tedious, and possibly even unimportant. What tasks most frustrates you? 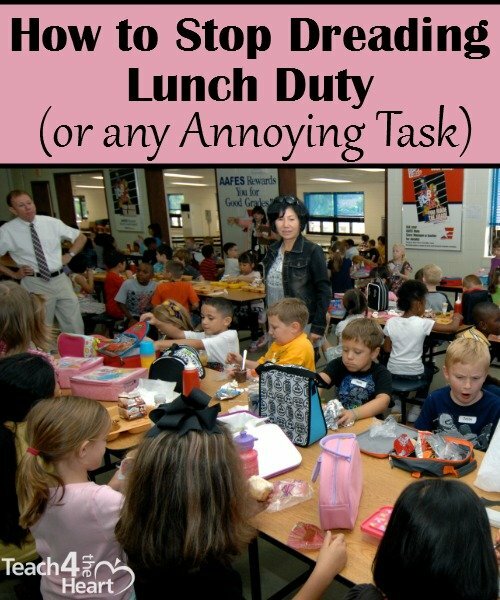 I think my least favorite task as a teacher was lunchroom duty. Trying to maintain control of 100 middle schoolers and make sure they clean everything up to boot….. No, it definitely was never the highlight of my week. But for the Christian, every single task we are given is important, whether it’s as glamorous as a pastor preaching to thousands of people, as everyday as a mom cooking dinner for her family, or as annoying as lunch duty. Yes, grading papers for God. Doing homework for God. Cleaning up messes for God. Everything we do should be for Him and His glory. Even if a task seems completely unimportant, we can give turn it into an offering of worship to our Savior if we do it heartily for Him. Most of us are fairly familiar with Colossians 3:23. We may even have it on the wall in our classrooms. But have we really stopped and considered this incredible passage? Let’s examine a few key aspects of these verses…..
We are to do what is required of us. First, we are to obey our masters. Well, we’re not bondservants and we don’t have masters, but the modern-day equivalent would be that we are to do what our boss (or teacher) asks of us. We are to be good workers (or students). We are not to strive to please men. How often do we try to do a good job so that our someone else is impressed with us – whether it’s an administrator, parent, student, fellow teacher, or even our own family? But that’s not the point. We’re not supposed to be doing our work to please people. We are to work for Christ. Instead of trying to please others, we should keep our focus on Christ, realizing that ultimately we are working for Him, not for our boss or our families or even for ourselves. Grading papers – it’s for Him. Lesson plans – for Him. Cleaning the house, doing homework, even lunchroom duty – all for Him. The most mundane task is valuable and worthwhile if we keep this in mind. We are to work with all our hearts. When we do a task for God and not our boss, we should then be motivated to do it to the best of our ability. Any task done with all our heart for God is an offering of worship to Him. God promises a reward. God doesn’t stop by giving us a chance to honor Him with our work. He goes on to promise a reward for our labor. So next time you’re frustrated by that mound of grading or dreading that next teachers’ meeting or after-school duty, remember that even the most seemingly insignificant of tasks has a Divine purpose. Remember that you can offer your work as an offering of praise and worship to Him, bringing Him glory with your efforts. And if you teach in a Christian school, the next time your students are complaining about another worksheet or another reading assignment, consider taking a few moments to discuss these truths with them as well. How often do you remember to work for the Lord and not for men? What helps you remember this? In my own life, I’ve struggled with work-related dangers on both end of the spectrum. Sometimes I forget how important the mundane tasks are to God and other times I’ve allowed my work to be an idol in my life. If you tend to fall more to the other end of the spectrum- assigning too much importance to the calling of teaching (or any calling) in your life, check out my post Can Good Things Become Our Idols?